Able Safety has been confirmed as the headline sponsor for the Safety & Health Excellence Awards 2019. The SHE Awards was launched in 2018 and it aims to recognise the key role that companies and individuals play in keeping people and premises safe. The Awards themselves will be presented at a gala dinner at The Vox, Resorts World Birmingham on 10 April 2019 hosted by popular comedian Sean Lock. Able Safety, supplies, hires and maintains all aspects of gas detection, working at height, breathing and emergency escape apparatus. 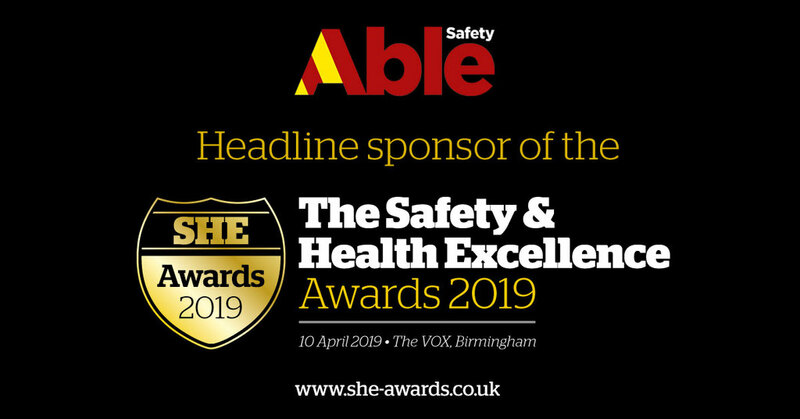 Able Safety attended the SHE Awards last year and were so impressed by the event that it has signed up as headline sponsor to show its dedication to celebrating and promoting excellence in health and safety.